Melbourne's street art is a must see attraction for all visiting tourists. There are so many laneways containing great artwork that you could spend multiple days enjoying this famous Melbourne tradition. 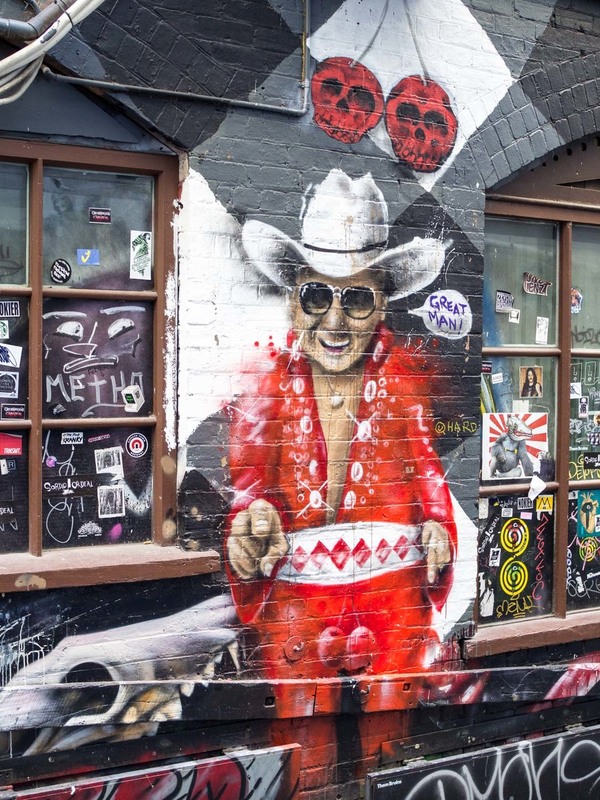 I prefer the area around the most famous of Melbourne's street art laneways, Hosier Lane. From here you are within 10 minute's walk of a few other gems such as Duckboard Place and AC/DC Lane, renamed in 2004 as a tribute to the band. These laneways are right in the heart of the CBD so you'll not be far from a cafe or restaurant plus the iconic Federation Square is just round the corner too. Perfect for a tourist tight on time or a local who wants to avoid walking around half the city. Be warned though, Hosier Lane IS the most famous laneway therefore expect to see groups of tourists and students strolling around snapping the art. It's busy for a reason though so just enjoy the art and the atmosphere too. AC/DC lane is much quieter and actually has my favourite pieces anyway. It really isn't hard to find. Get a train or tram to Flinders Street Station then walk across the road, through Federation Square then cross Flinders Street. Hosier Lane is just off Flinders Street, take a look at the spot marked on the map below for help. Easy. AC/DC lane is up the hill from Hosier Lane after which you turn right then right again. This is obviously amazing. A guitar wielding baddy right at the start of AC/DC lane, perfect. Even if you're not a Star Wars fan I'm sure you can appreciate this one. I spotted this just as 'The Force Awakens' was released, not sure if it was created in time for the movie or just a coincidence? Either way it's great. Photographing it and the other art below, unless stated otherwise, was all on my OMD EM-10 25mm F1.8. Hard to go wrong when the colours are this good! A Stormtrooper guarding AC/DC Lane, Melbourne. Not far from the Stormtrooper you'll find his mate, the cowboy. As with the Stormtrooper it's huge! AK47 street art on AC/DC Lane. Looking down Duckboard Place at Tonka. Taken from the bottom of Hosier Lane, Melbourne. Movida on Hosier Lane is a great place to eat after exploring the lane ways. Taking photographs in this area is great fun. You can do it with any camera as the art does all the hard work. I took all the photos on this page with the Olympus OMD EM-10, I think it does a great job of producing accurate colours. The other great thing about the laneways are the restaurants. Tonka and Movida, both shown above, are right in the middle of the street art and are fantastic. Tonka is lovely and I had an amazing curry there not too long ago. Alternative Street Art Locations in the CBD? Of course, Hosier Lane and it's immediate neighbours are just a fraction of what Melbourne's Street Art Laneways have to offer. Street art on Union Lane, Melbourne. Taken with the OMD EM-10 and 12-40 f2.8 lens. 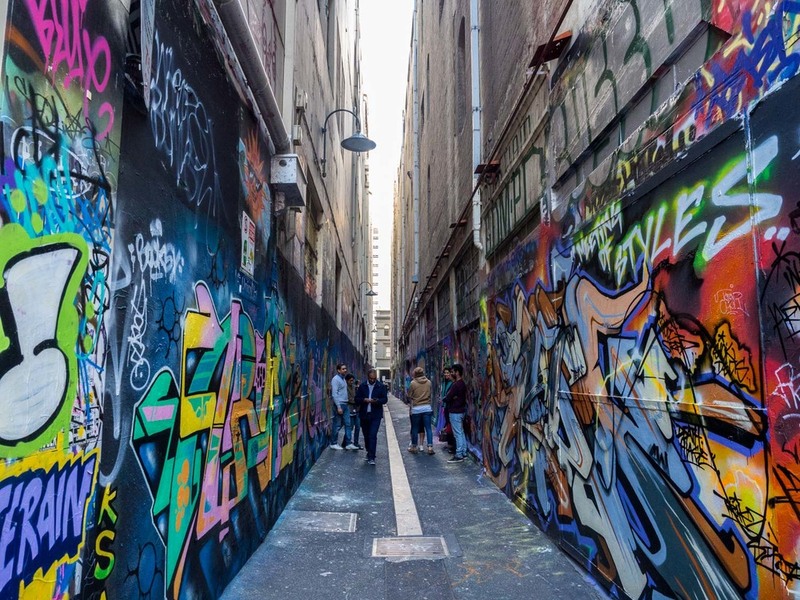 You can take a look at thatsmelbourne for a list of lots more laneways to visit. They're mostly in the CBD, in fact the photograph above is of Union Lane which is just off Bourke Street Mall, by Myer and David Jones. Alternatively here is a list of what I consider to be some excellent laneways to visit and practice your photography. China Town has its own street art too, have a dumping or ten and take a walk down Caledonian Lane. Escaping from the shops on Bourke Street? This lane (pictured above) is a great place to escape and take a few photos. This lane is just off Flinders Lane and contains a lot of bars and cafes, as well as some great street art. I had great fun taking all these photos. If you have a favourite laneway not mentioned here, feel free to let me know. I have plenty more to explore so will gladly take your tips and advice, along with my camera next time. Thanks for reading.